Christians believe that the teachings of Jesus and the Apostles were preserved in the scriptures as well as by word of mouth and were handed on. This perpetual handing on of the tradition is called the "Living Tradition"; it is believed to be the faithful and constant transmission of the teachings of the Apostles from one generation to the next. That "includes everything which contributes towards the sanctity of life and increase in faith of the People of God; and so the Church, in her teaching, life and worship [the Creeds, the Sacraments, the Magisterium, and the Holy Sacrifice of the Mass], perpetuates and hands on to all generations all that she herself is, all that she believes. "[not in citation given] The Deposit of Faith (Latin: fidei depositum) refers to the entirety of divine revelation. 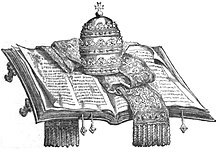 According to Roman Catholic theology, two sources of revelation which constitute a single "Deposit of Faith", meaning that the entirety of divine revelation and the Deposit of Faith is transmitted to successive generations in scripture and sacred tradition (through the teaching authority and interpretation of the Church's Magisterium (which consists of the Church's bishops, in union with the Pope), typically proceeding synods and ecumenical councils).